Steering, Suspension, Shocks and Struts Repair. Houston’s low cost steering, suspension, shocks and struts repair center offering quality auto repairs at low prices. We guarantee lowest prices on all steering, suspension, shocks and struts repair. Call us today at 281-661-8180 to see how much we can save you today. We are Houston steering and suspension, struts and shock repair specialists. The steering and suspension systems in your car, SUV, trucks and vans keep your car driving smoothly on the road . it is important to make sure your steering, suspension, struts and shocks are working optimally as this enhances your smooth ride. You won’t get a better deal! Guaranteed. Call us today..
Shocks or Shock Absorbers are used on cars and light trucks with standard suspension systems. Shocks may also be used on the rear of some front wheel drive cars that use McPherson strut suspension in front. Shocks provide resistance by forcing hydraulic fluid (oil) through valves in the piston as it moves up and down. Because the oil cannot be compressed, only a certain amount of fluid can be forced through these valves, which creates resistance to vehicle movement. Premium shocks are superior to regular hydraulic shocks because air in the shock is replaced by pressurized nitrogen gas. This prevents bubbles from forming in the hydraulic fluid. These bubbles, called foaming, reduce the ability of shocks to provide resistance and prevent bounce. Gas shocks also quicken the response of a shock’s movement, thereby increasing comfort and control. Because it integrates different components into one assembly, a strut serves multiple purposes. With its spring, it can support the weight of the vehicle, while moving to adapt to road irregularities. The internal shock absorber dampens movement of the spring as it compresses and rebounds during vehicle travel. The strut housing serves as a structural part of the suspension system and connects the upper strut bearing to the lower ball joint, so that the entire assembly can pivot when the steering wheel is turned. Your vehicle’s struts should be checked once a year, usually in conjunction with a wheel alignment. Under normal conditions, the shock absorber portion of the strut cartridge wears out gradually, and you may not notice incremental losses in ride quality, handling and control. in Houston, we are your Steering, Suspension, Shocks and Struts repair specialists. call us at 281-661-8180 today. 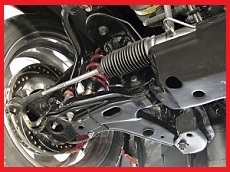 Some signs that your vehicle may have worn struts include bottoming out, excessive bouncing, rocking back and forth, drifting or nose-diving while braking, swaying, or cupping wear on the tires. If your car needs strut service, it may also be a good time to replace the coil springs. Since they usually need to be removed when changing struts, you can save labor costs by installing new springs at the same time. For a complete check of your vehicle’s Steering, Suspension, Shocks and Struts system, have it thoroughly inspected by a Ramy’s Garage Technician.